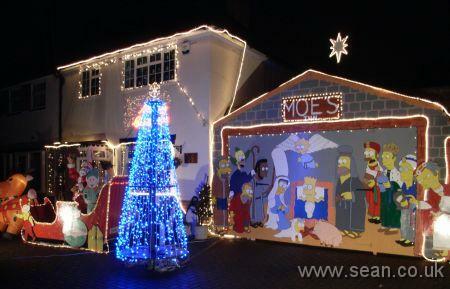 "Jingle Bells, Batman smells, Robin laid an egg..."
Many people decorate their houses on the outside with lights, but few go to the trouble of erecting a wooden facade in front of the garage and painting a Simpsons nativity scene on it. My neighbours did. The front garden also includes a life size Santa who moves his head, waves his arm and sings; a sleigh and an inflatable reindeer. My novel University of Death: Available now! I'm delighted to say that my satire of the music industry 'University of Death' is available now, exclusively from Lulu. You can preview the first two chapters now. When you order it, your copy is printed and bound and sent to you in a sturdy cardboard box. The book is 380 pages, and 6x9 inches (which is a bit like a hardback without the hard cover). The book costs £9.99 plus shipping, which varies depending on where in the world you are. In my last quality check, I still found things I would have liked to have done slightly differently, but the book is definitely ready for the world now and any more editing would be tinkering and procrastination (which as we know is fear in slow motion). After working on this for about two years, it does feel odd to be sharing it with the world now. Karen was the first person to read it when I'd finished it, and when we discussed it, it felt strange to hear her talking about people like Dove and Bigg, who for such a long time had lived in my imagination alone. I'd never heard their names spoken out loud before. I am excited that new readers will be meeting them for the first time soon and discovering their story. This is kind of a soft launch to blog readers. I am planning to put together a corner of this website about the book, which will include an author interview. If you've got any questions you'd like to pose about the book or how it came together, feel free to email them over or put them in the comments here. In exchange, I'll try not to be too much of a luvvie in the answers. I'll also be putting together a few special features and a book preview in PDF that's easier to print. Phew. Now I'm off to relax with a Chinese take-away and a silly film with lots of explosions in. Perhaps later I'll have a celebratory game of Beach Head. PS: The book makes an ideal Christmas gift (hint, hint - but not for me, I've got plenty). Lulu took nine days to deliver my latest copies this week, which is slower than its usual target of printing in 4 days, but you should still be able to get copies in time for Chrimbo.